For my mom and dad, seeing a Northern Flicker (Colaptes auratus auratus) is a fairly common occurrence at Oxtongue Lake, in Ontario. The birds frequent their backyard and beach property because both locations have sandy soil with a good supply of ants. 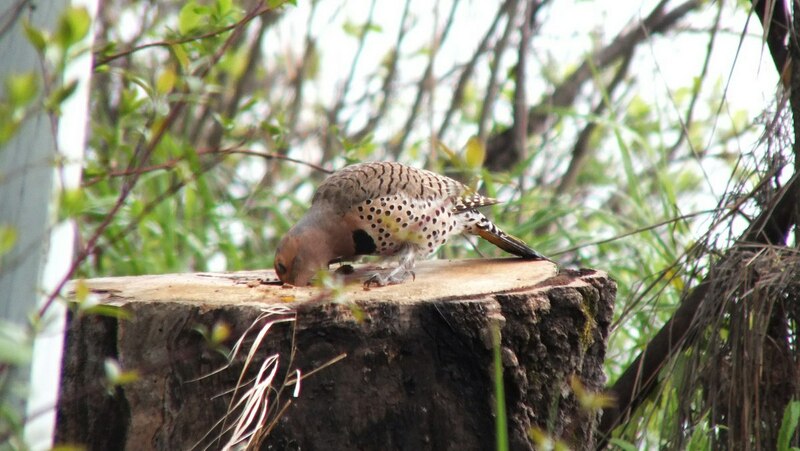 When Bob and I visited in mid-May one spring, I was lucky enough to see a female flicker industriously trying to find some grubs in an old tree stump. 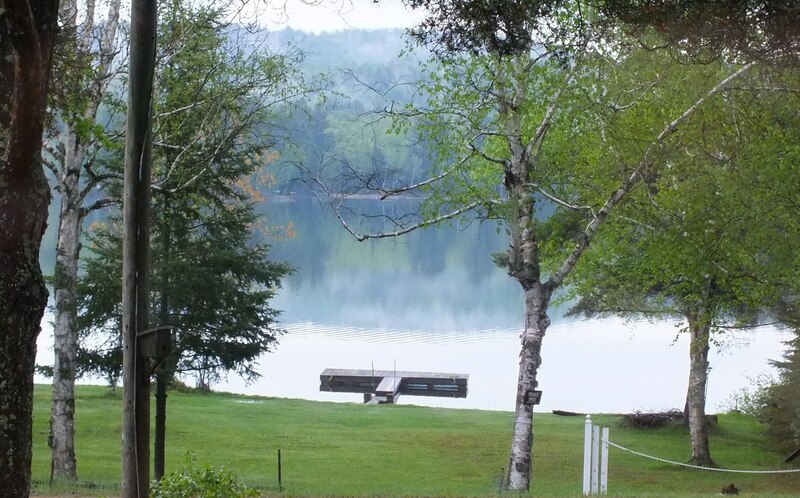 Oxtongue Lake Community is situated on the shores of a pretty lake sharing the same name, and it offers lots of opportunities for wildlife sightings and outdoor experiences. 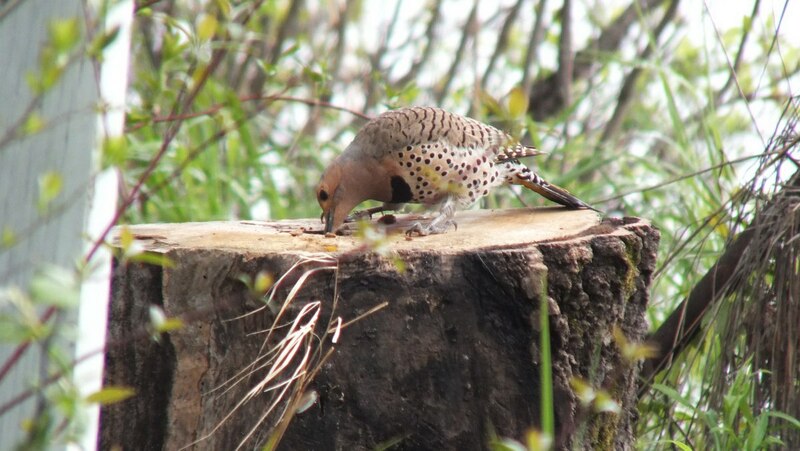 I first spotted the flicker at the top of a poplar tree, it flew down into the grass and then settled at the side of an old stump that is well on its way to rotting. 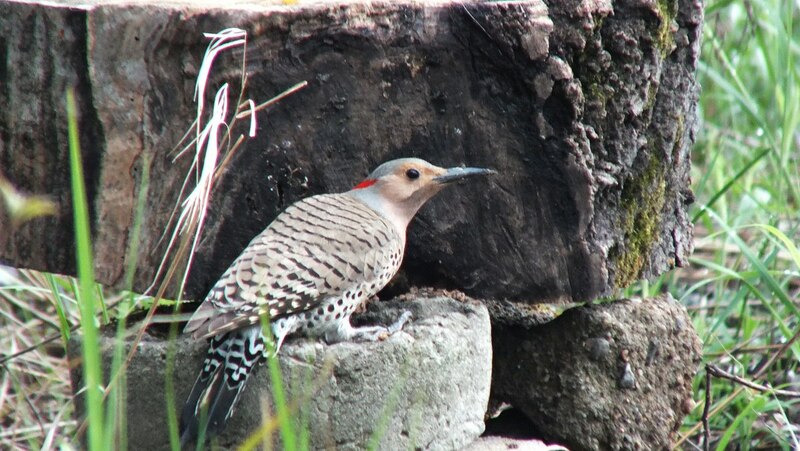 I knew the flicker was a female because she lacked the masculine “black moustache” on either side of her face. and eventually moved to the top of the tree stump. 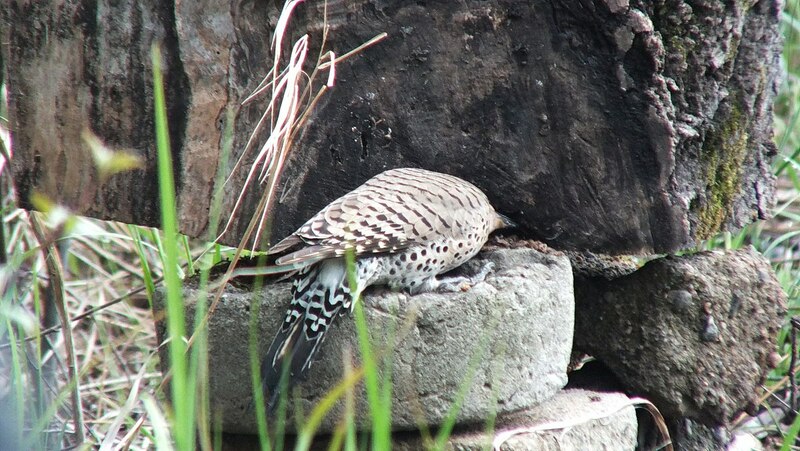 This is a Yellow-shafted Flicker, recognizable by the yellow feathers on the underside of the tail. The flicker’s soft grey cap and creamy beige face are offset by the red bar at the nape of the neck. The black speckled plumage is so showy! While I watched, the woodpecker put a lot of effort into looking for insects and dug deep into the softer tissues of the wood there in the center of the stump. 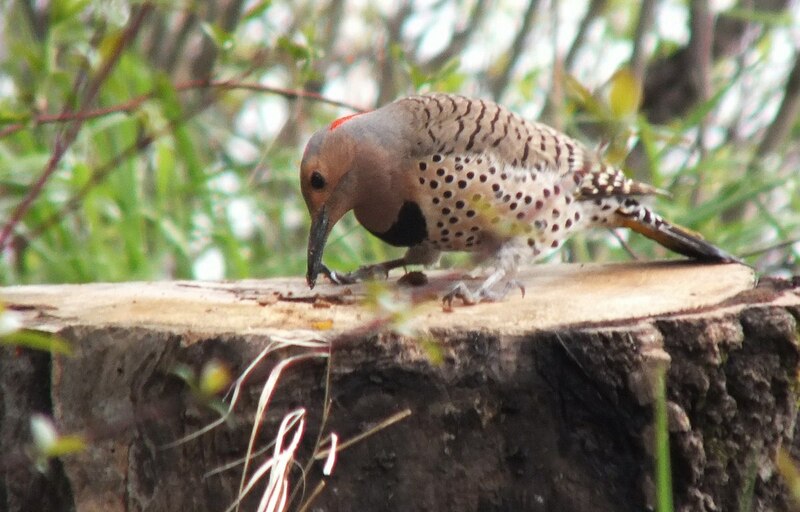 A northern flicker’s tongue can dart out 2 inches beyond the end of the bill to snare insects, so whatever was making its home there in the rotting wood didn’t stand a chance. I was ill-prepared for the wet conditions there on the beach, having run down there on the spur of the moment, so as I clicked my camera, water soaked through my light shoes. The odd blackfly was pestering me, but the temperature was almost balmy even given the early hour of the day. 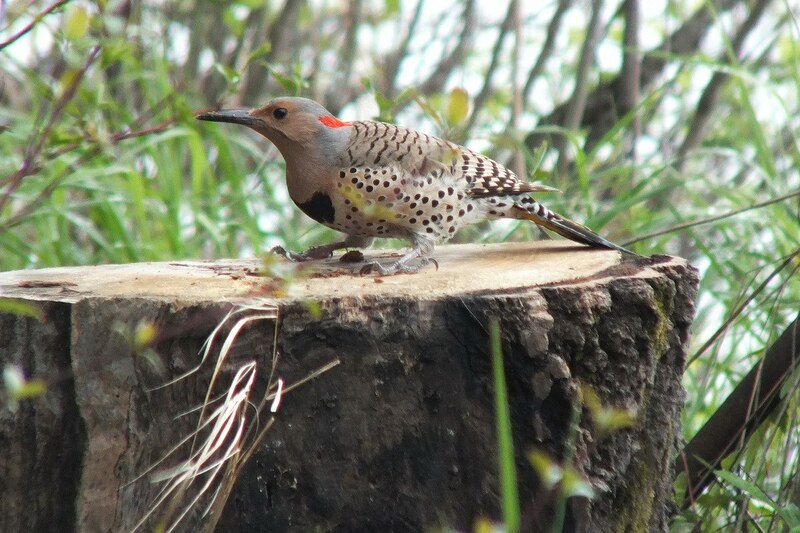 I persisted in order to see the northern flicker rewarded for her efforts. Finally, the flicker came up with some tiny morsel and then quickly flew away. I was satisfied with my experience despite having wet feet! 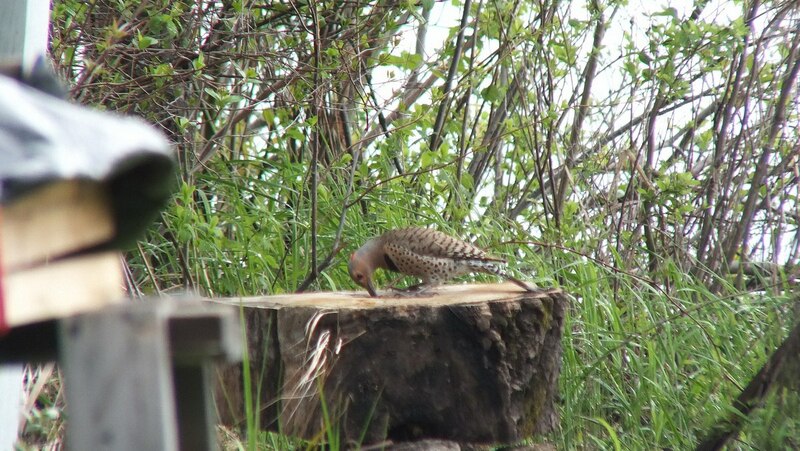 Next time, maybe I’ll get to see the male flicker. 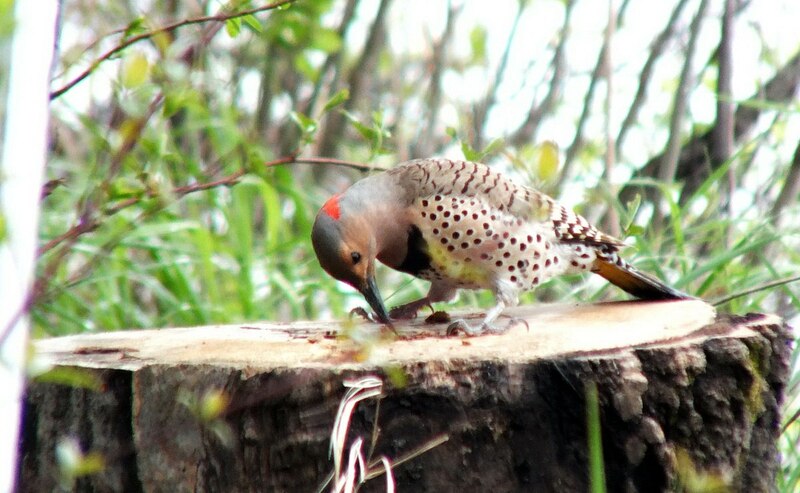 Northern flickers are big ant eaters. 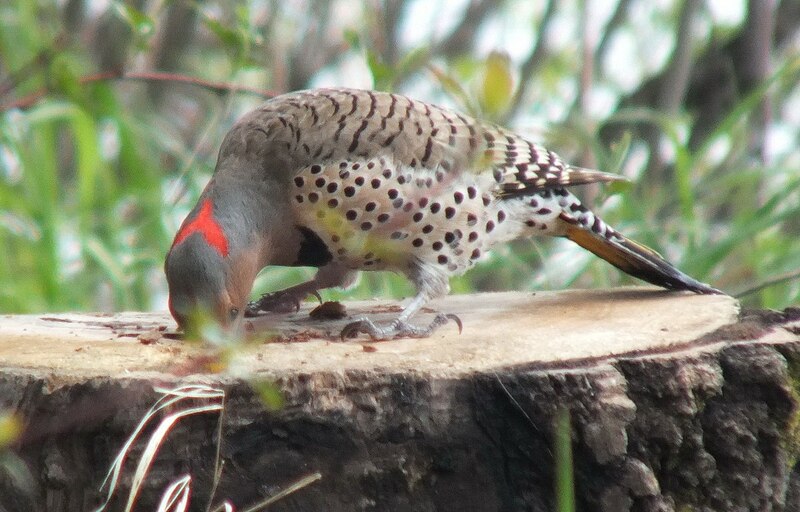 I felt guilty when one time I was walking on a sidewalk, and a northern flicker came down to eat ants coming out of a crack in the side walk. I flushed the bird off, when I walked towards it (I was bad!!!!!!!!!!!!!!!!!!!!). But during the winter, put up the suet cakes, because the northern flickers will just devour them.